This week I am offering a series of 8 free printables from my Basic Blog Planner and Complete Blog Planner totally for FREE! Today’s printable is a spot to help you keep track of all the usernames and passwords that you use in connection with your blog. (You could use this printable even if you aren’t a blogger, too!) 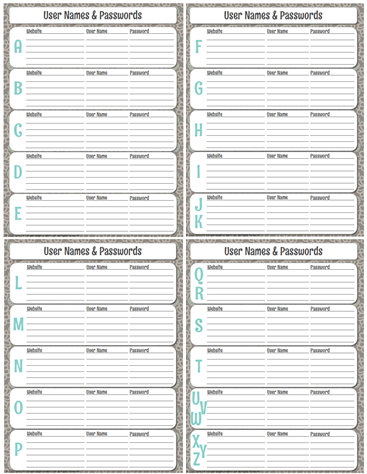 It is a 4-page printable and is divided into alphabetical sections to help you find the password you need easily! ****If you don’t feel comfortable saving a whole list of passwords, you could easily put a “code” name for your password that only you would know. Example: If your password is your dog’s name + the year you got him, instead of writing down “Spot2010”, you might want to write “dogb/d” or some other code that would remind you. Just be sure that your “codes” aren’t too hard for even YOU to remember! Feel free to download my printable Usernames & Passwords HERE, but please respect my copyright listed below the image. Thes printables are © Copyright 2013 Organizing Homelife and is intended for personal use only. Please do not distribute this file for free or for profit without written consent. Thank you! I now have a new Printables Shop!! You can check my new shop here. Are you interested in my Basic Blog Planner? 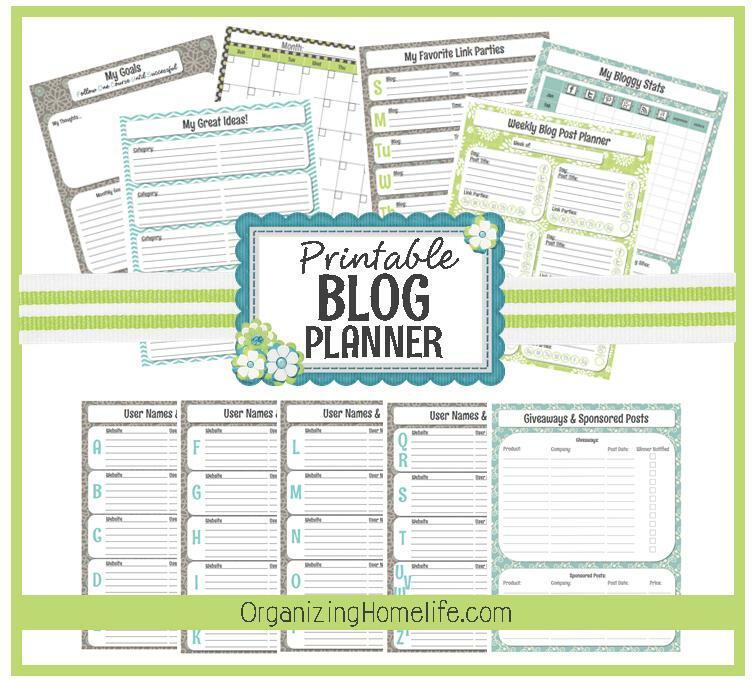 It has 11 printables to help you organize your blog. You can download the whole thing HERE for just $5! Do you need to keep track of affiliate sales, sponsored posts, travel and conference expenses? Do you have blog friends that you would like to keep information on like cell phone #’s, hubby’s & kids names and more? How about a full 12 page, 2013 calendar to keep next to your weekly post planner? Check out my Complete Blog Planner HERE. It has over 30 pages of detailed information to keep your blogging organized and on target! 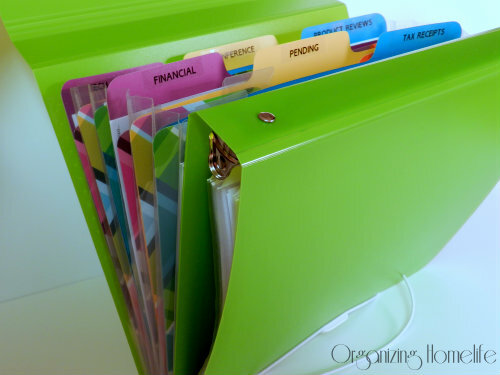 By the way, if you haven’t seen it yet, I’m hosting a giveaway through 2/3/12 for the fabulous Duo Multitasking Binder that I use to keep my blog paperwork organized. Check it out HERE – there will be 5 winners! Hi Ginny, thank you so much for the free printables you share, they are awesome. Not too complicated for my ADHD to handle and very well done. If you can’t get me more organized with all your helpful ideas and helps i think i am hopeless. Thanks so much! God bless you! Thank you, thank you, THANK YOU!!! :0) I needed this printable like you would not believe!!! Ginny, thanks SO much for this. I’m not a blogger, but my hubs was recently in the hospital….that’s when I realized I didn’t have passwords to everything he pays online. I had made a list of these, but the printable looks so much better in my binder! Love ya! I’m glad you like it, Vivian. And, I hope your husband is okay!! Yippee! Imagine my delight when I went after those cute folders at Walmart and they were clearance-ing them out at $1.00 per pack….then imagine the ear to ear grin on my face when they rung up at only 25 cents. WOOT WOOT! Thanks for sharing. Thank you so much, I’ve been looking for something like this to write everything down because I’m always forgetting ! Love your site. Thanks for your fabulous work! This is AWESOME! You have made the BEST layout for recording User Names & Passwords I have seen. I have been using a small book for passwords that I purchased at a gift store. It’s not in alphabetical order so I have to flip thru it until I find the web site. Now I can put them in alphabetical order! Thank you SO VERY MUCH!!! I’m so glad to hear how much you like it, Patty. 🙂 Enjoy! Thank you for the GREAT printables! You are an inspiration! Love your printables – they are just my style!! Thank you so much for your generousity! I absolutely LOVE organization, especially with cute decor! After writing down several usernames and passwords, deciding I needed to organize them, and finding this, I am SO pleased! I love your style. Thank you very much for making this accessible and free! Thank you so much! These will definitely be a great help.